The Hon. Secretary of the Leicestershire & Rutland Golf Union is Terry Walker. Terry is a currently a member of both Lingdale Golf Club and Kirby Muxloe Golf Club. He is previously held the position of Managing Secretary of Lingdale Golf Club, where he had the distinction of being awarded the Runner Up position in the 2010 Golf Club Manager of the Year competition. He is now Club Manager at Kirby Muxloe Golf Club. Terry was elected to office in 2015 and has had golf administration experience not only at Club level, but has also been involved at County, Regional and National levels. Terry hasn't won The Open!! 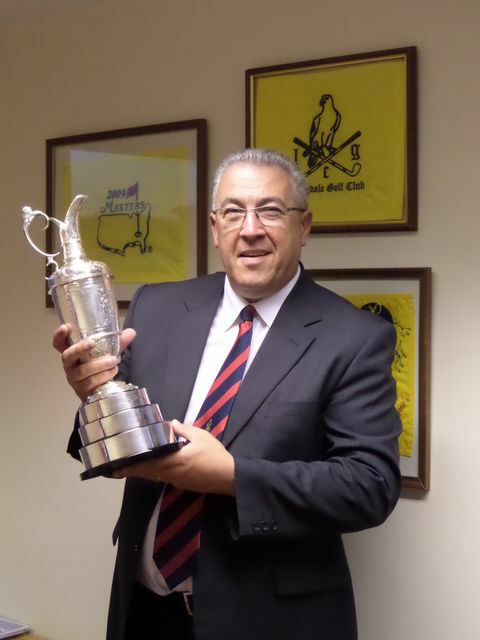 When he was the Business Manager at the West Lancashire Golf Club in 2014, they hosted the R&A's Junior Open where 125 junior golfers under the age of 16 from 75 countries around the world competed. The Claret Jug was brought up from Royal Liverpool Golf Club, the venue for that year's Open Championship, for the competitors to view. Terry was then asked to look after it overnight pending its return to Hoylake the following day.